Gamescom 2013 is underway and it’s already causing huge waves throughout the gaming industry. EA Sports today announced exclusive FIFA 14 Ultimate Team Legends content for the Xbox 360 and Xbox One. Legendary football players, such as Pelé, Patrick Vieira and David Seaman will all be joining the Ultimate Team mode in FIFA 14. For the first time in the history of the franchise players will have the opportunity to craft their perfect Ultimate Team with a mix of legendary football superstars and today’s brightest players. Each Legend has been individually designed to better reflect the skills and abilities that made them legendary. 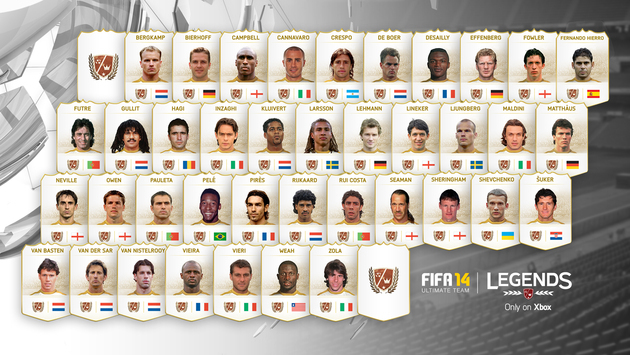 All of the legendary players will be available in random Gold Packs at the beginning of the Xbox One launch. It’s the latest in a long-line of exclusive content announced for the next-generation Xbox, but is it enough to counter the avalanche of bad press?